qualified advices on how to set up business premises. easier. Let's talk business and work together – we're here for you. Place your order online and we will contact you. The office space installation is a challenging task, especially if you have more than two employees. Yet with modern style BEKANT office furniture, you can make it without hassle. 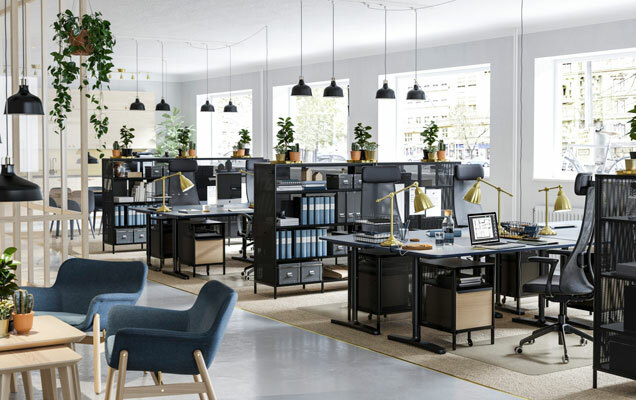 The desks, file cabinets and pendant lamps paired by colour and style help create functional workspots for all co-workers, and there also are some shelving units that serve for partitions and make the open office space more private. What's for lunch? A canteen that can be mistaken for a small restaurant and an appetizing Scandinavian interior. The NORRÅKER dining furniture are here to make everyone feel comfortable. The durable and hard-wearing tables and benches together with LEIFARNE chairs meet the requirements on furniture for public use. These chairs let sit comfortably thanks to the restful flexibility of the scooped seat and shaped back, a special surface treatment on the seat prevents from sliding, and they can be stacked to take less space when not in use. 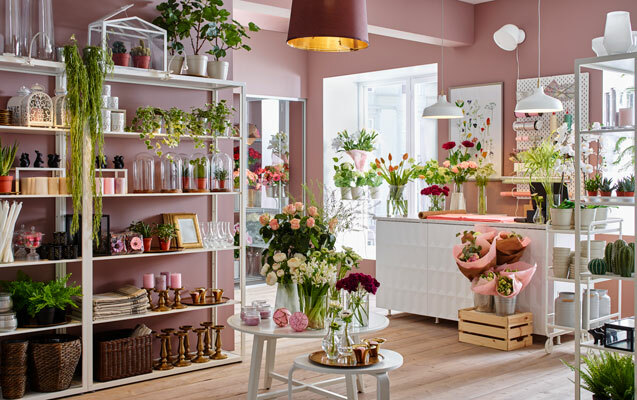 The cosy flower store in the city is full of attractive contrasts. Here, you can see a combination of modern style office furniture and elegant coffee tables, rustic wooden boxes and charming accessories. Take the FJÄLKINGE shelving units as an example: strong and durable shelves are made of steel, but look light and airy. The clean, simple lines make them easy to combine with many styles of furniture. When you have the same premises for everything from computer desk to workshop area, the IDÅSEN sit/stand desks become very useful. When needed, the desk can be moved to other place or used with either TROLLBERGET active sit/stand support or swivel chair. This industrial interior also features HEKTAR pendant lamps and VEBERÖD shelving units. 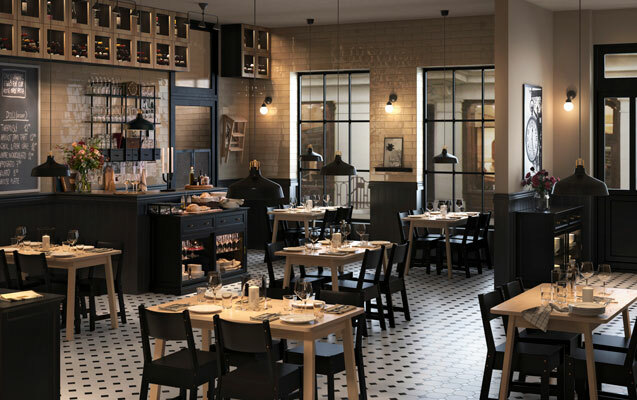 This traditional style restaurant features dark colour palette and dining furniture made of wood. The durable and hard-wearing NORRÅKER dining tables and chairs made of solid birch meet the requirements on furniture for public use. The black NORRÅKER chairs repeat the colour of MALSJÖ sideboard and can be neatly stacked to one side when it’s time to clean the floor. The right display can make your products practically irresistible. We can show you how to display your delicious delights in imaginative, affordable ways that truly show them in their best light. And that really make a difference to your sales. 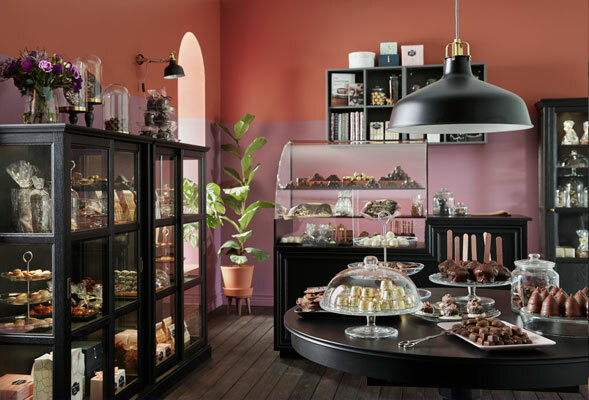 You will need a MALSJÖ glass-door cabinet with a distinct handcrafted character, some EKET wall cabinets, and an extendable INGATORP table (in case your chocolate exhibition increases unexpectedly). This open office and conference hall in one has plenty of room for both working and meeting, as the modern BEKANT office furniture (such as corner desks for designers and web developers or conference tables for discussions and brainstorms) help use every corner of the premises. What determines success of a restaurant? We believe that interior design contributes here a lot. 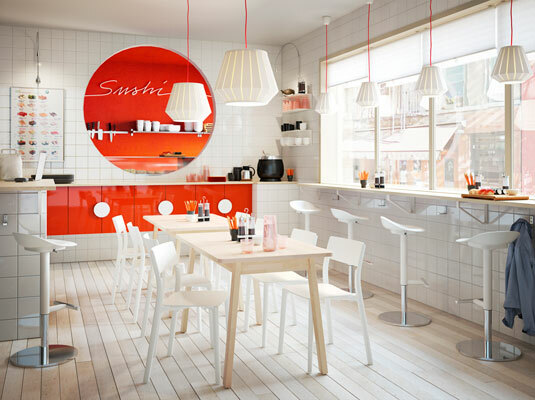 The white yet bold interior of this sushi restaurant looks appetizing, doesn't it? 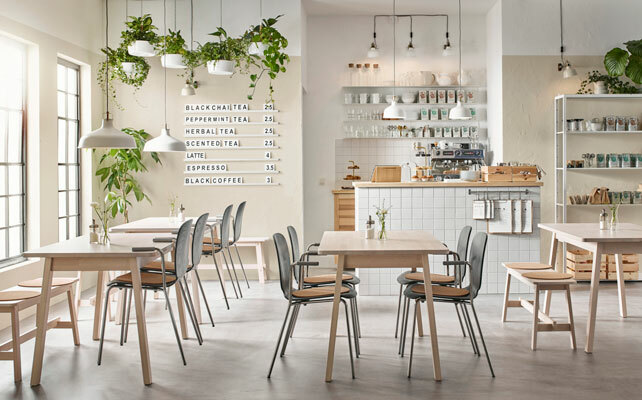 It reflects the Scandinavian style by combining white and wooden furniture, such as NORRÅKER tables made of light wood, JANINGE bar stools and chairs with armrests that can be hung on a table top for easy cleaning. The accent cabinet doors in bold colour and pendant lamps with red wires are here to bring more style and drama. Pastel colours and modern office furniture is a great combination for a travel agency that feels like home. 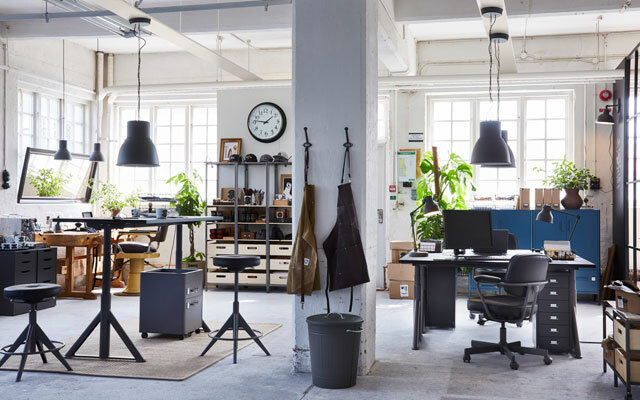 Three lined BEKANT desks remind of a long dining table and are accompanied with many different chairs, such as HATTEFJÄLL swivel chairs for co-workers and LÅNGFJÄLL chairs with generous cold-foam seats or YPPERLIG chairs with armrests for customers. What else to add? Some capacious FJÄLKINGE shelving units for travel brochures, a few of wall clocks, a large world map, and friendly service is all you need to succeed. A personal workspot in a big office is more than important. So get into the zone and make it your own using the BEKANT office desks with screens. 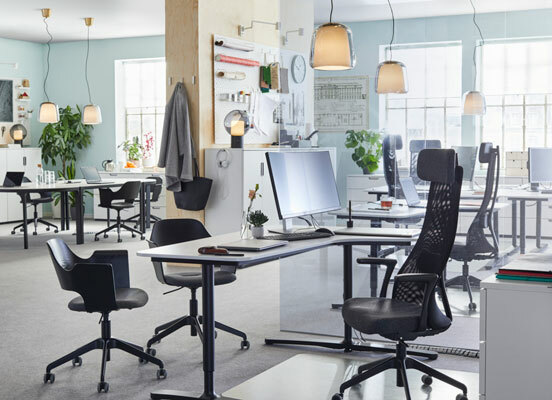 The sit/stand desks let you change positions between sitting and standing, and the screen creates a quiet and pleasant working environment by providing privacy and absorbing sound. 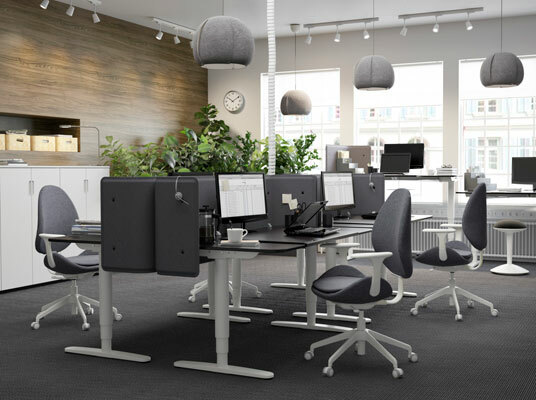 A grey colour of the screens is repeated by HATTEFJÄLL swivel chairs and VINTERGATA pendant lamps. An office for creative contemporary people has to be creative and up-to-date, too. So here, next to comfortable workspots with BEKANT desks and ergonomic swivel chairs, you will also find a spot to chat or play some table games, as well as lockable HALLAN cabinets for co-workers and storage for their bikes. 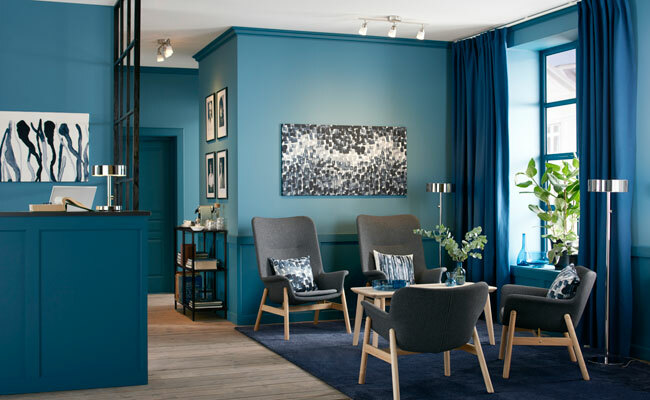 Create an inspiring hotel reception with a waiting room that makes the waiting more pleasant. Choose a bold colour for the walls, carpets and curtains, then add some neutral wall accessories. Finally, place some modern style VEDBO armchairs and a LISABO coffee table. 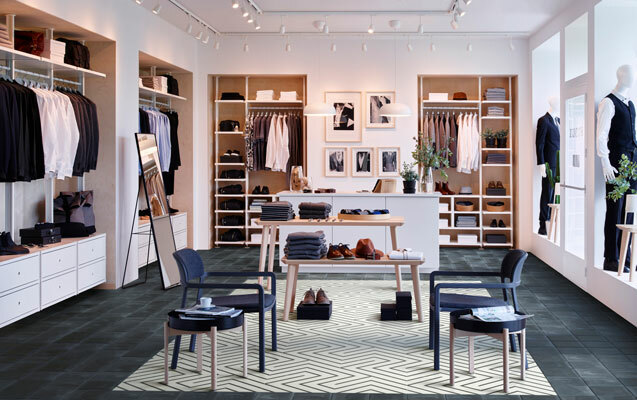 Combining ELVARLI storage and display systems with LED lighting solutions is a good start for a men's clothing store. Sturdy storage sections let you display clothes and accessories of the latest season in a modern way, and the YPPERLIG armchairs with coffee tables make customers feel like home. Invest in quality and style – the right display can really make a difference to your sales. Right before your eyes, there is a modern conference hall with modern office furniture and bright lighting. A bunch of BEKANT desks placed along the perimeter of this room let the participants of the meeting see and hear each other with ease. 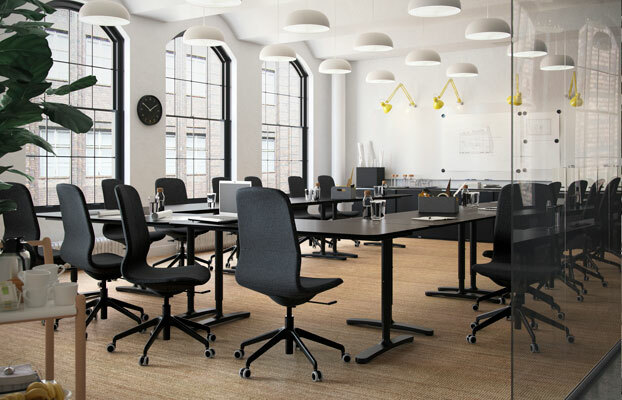 The LÅNGFJÄLL office chairs provide comfort that helps you concentrate, and the NYMÅNE pendant lamps ensure good general lighting. 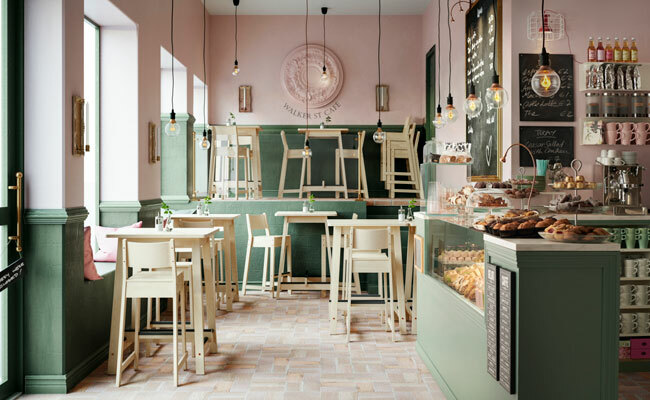 Take a pastel colour palette, add some warm lighting and natural wooden furniture, and you will have a simple formula for creating your own hospitality business. 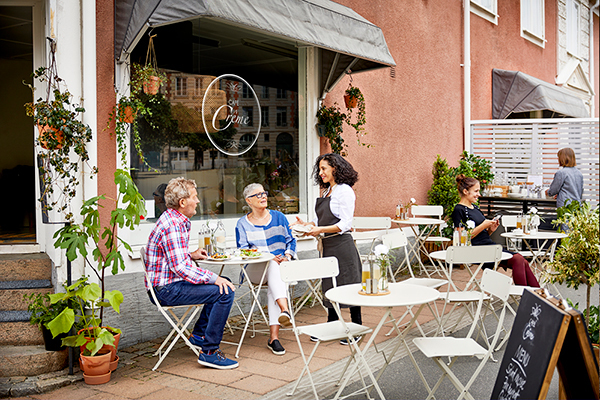 The NORRÅKER bar tables and stools have been tested against strictest standards for stability, durability and safety, so they meet the requirements on furniture for public use. Provide a colourful menu, a friendly service, and voilà – your Scandinavian style snack bar is already ready! This guesthouse in the countryside meets different needs of all family members. Its roomy terrace can be used for both office parties and family leisure, since the furniture combinations adapt to different situations: SOLLERÖN modular sofas and stools are made for relaxation, outdoor dining table with chairs can fit your celebrations, and light UTTER furniture are perfect for small children to sit at and play. Breaks at work become even more pleasant when the co-workers have their own courtyard to get a sip of fresh air. Having a solution for employee's rest outdoors also means having a place to hold office parties or business lunch. What do you need to set up one? 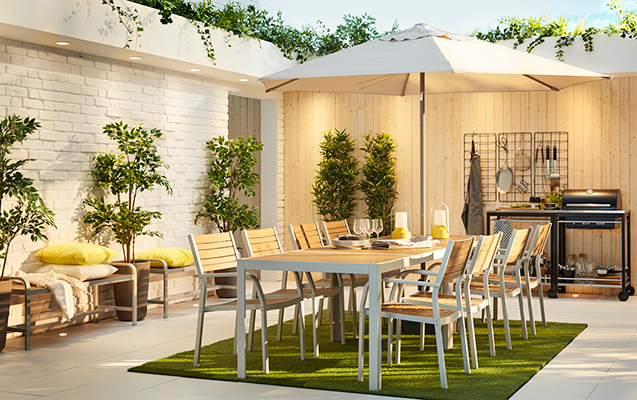 Our formula is: RUNNEN floor decking made of solid wood or artificial grass, sturdy SJÄLLAND tables and chairs with armrests, KLASEN charcoal barbecue with trolley, and KUGGÖ/LINDÖJA parasol with base in case you need protection against the sun. 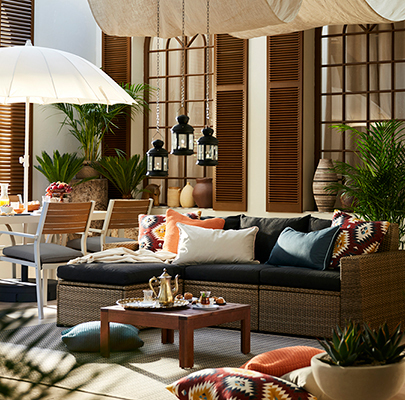 The indoor courtyard can be used as a place to rest, too. To make time spent here even better, decorate the area with ROTERA lanterns, natural plants and textiles, and add some functional outdoor furniture, such as ÄPPLARÖ coffee table and SOLLERÖN modular sofas. Made of handwoven plastic rattan that looks like natural rattan, they also have practical storage space under the seat. Make every vacation at your apartments unforgettable! 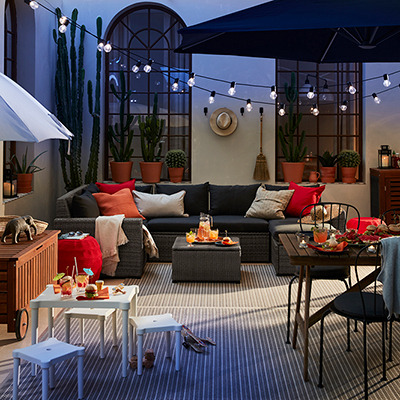 Build a cosy oasis on your open sky terrace with our outdoor furniture, like HAVSTEN modular sofas. They have been awarded with the 2017 Red Dot Award: Product Design, as the outdoor sofas designed to be functional and meet the various needs of outdoor environments. 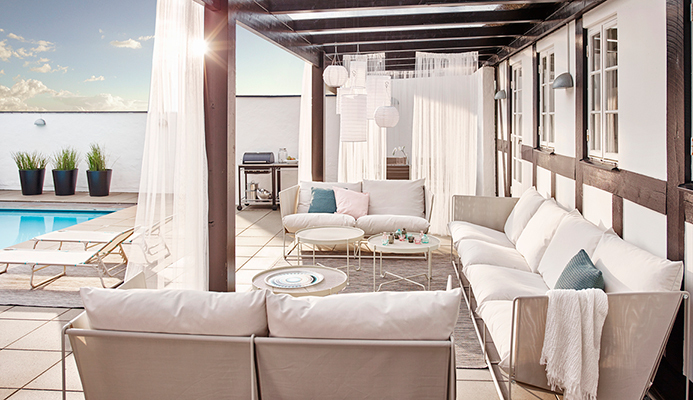 The powder coated steel and fluffy, comfortable cushions resist both broiling sunlight and light rain. HAVSTEN is a durable and neutral base that you can easily add to and move around to create your own solution. Actually, you don't need much to turn a quiet terrace or an old town sidewalk into a lively outdoor cafe. Start with the SALTHOLMEN outdoor furniture made of powder-coated steel. The table and chairs are durable, easy to care for and to carry outdoors. Besides, they take little room to store as both the table and the chair folds flat.